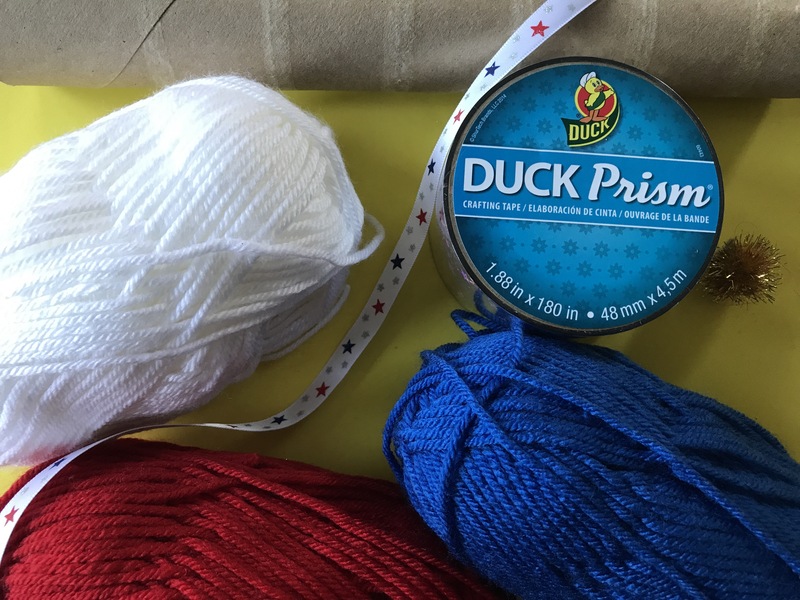 The Fourth of July is fast approaching. 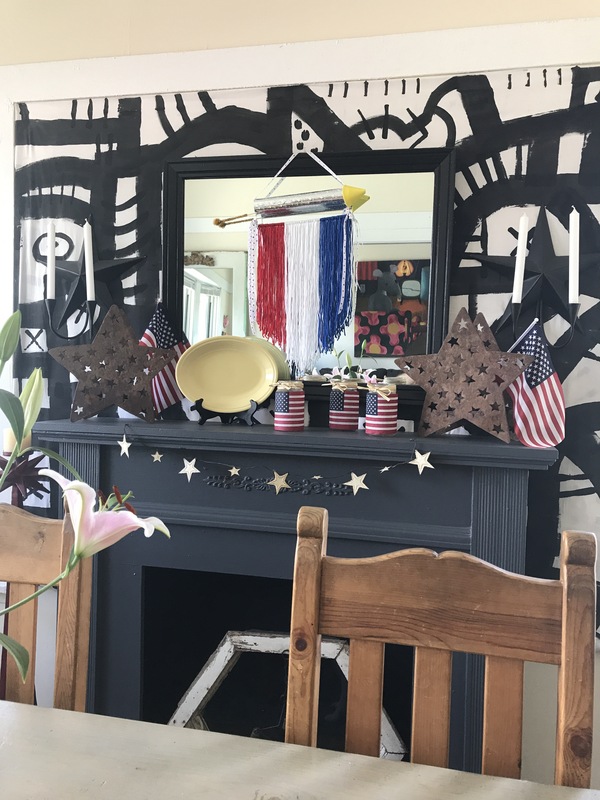 I wanted to give my mantel a quick update for the holiday and create a new craft for the occasion. 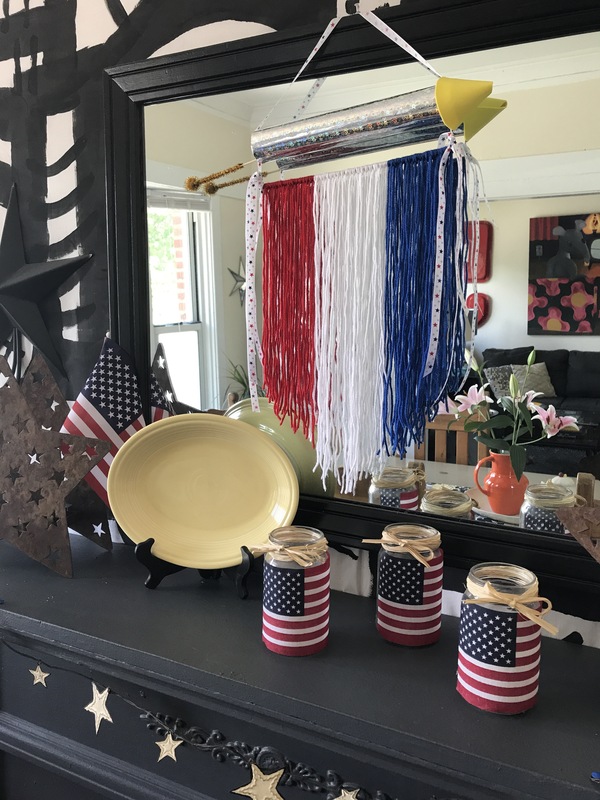 I decided upon making this adorable firework wall hanging. It came together so easily and is the perfect focal point of my display. It’s really too cute next to my Patriotic Candle Holders. I recently discovered that there is a Duck Tape Festival! 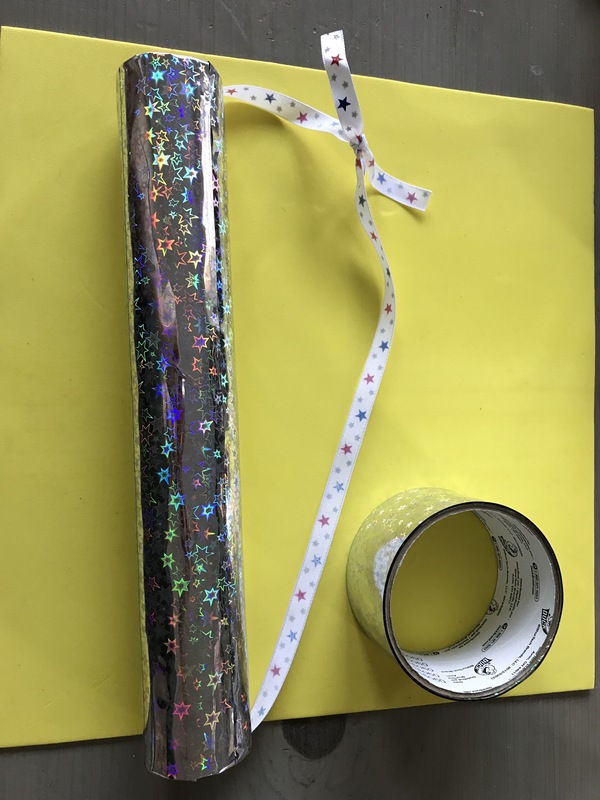 I was inspired by all of the creations I saw online at the event and decided I needed to use Duck Tape in my next project. 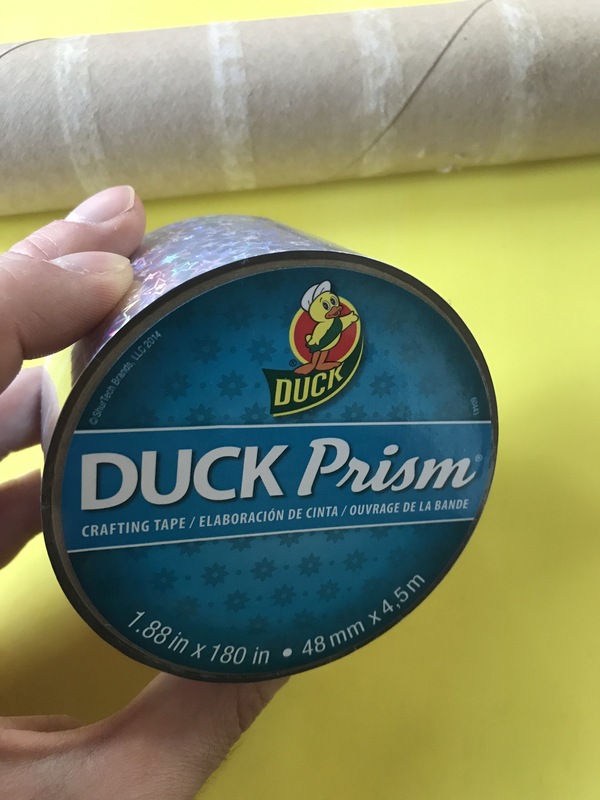 There are so many cool kinds of Duck Tape. 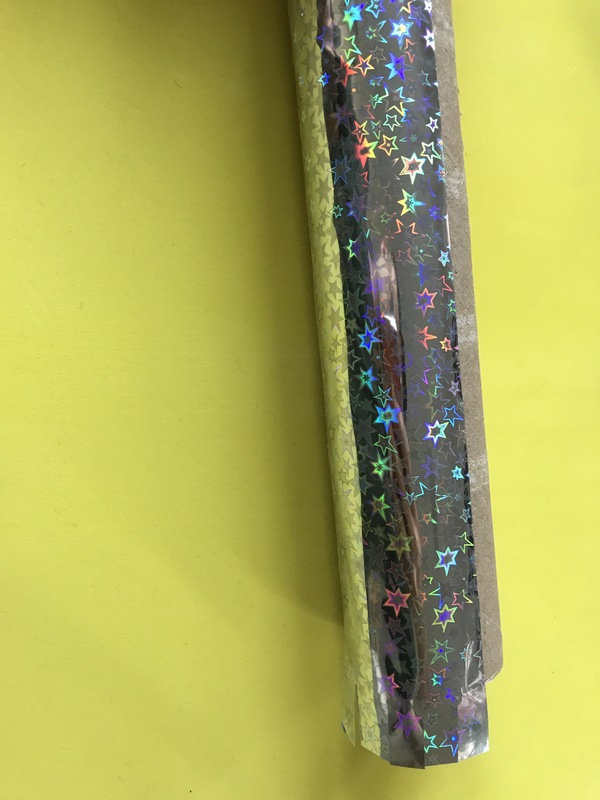 I chose a holographic star patterned one from their Prism line. First, I covered my paper towel rod with the Duck Tape. I ran three strips lengthwise and left overhang on each end. I cut slits on the ends and tucked the excess inside the paper towel roll. 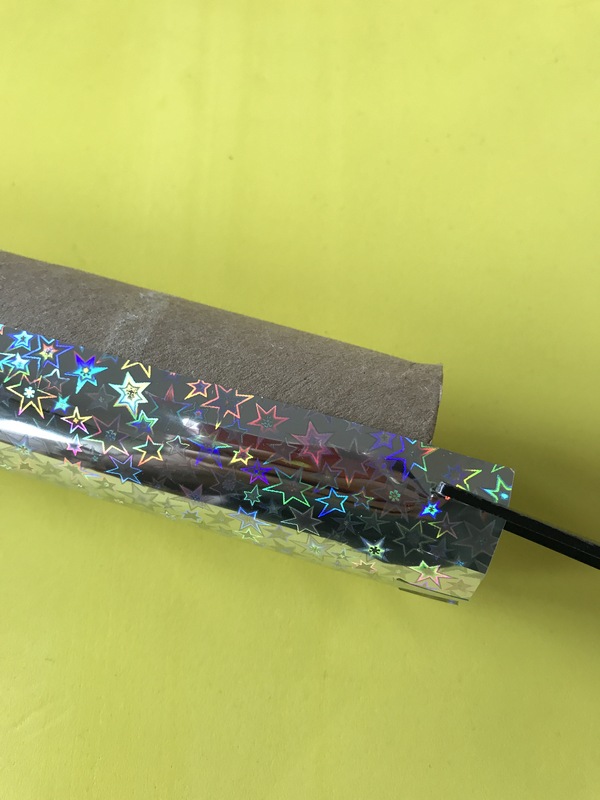 Next, I ran a piece of decorative ribbon through the paper towel roll and tied it into a knot. This will act as the hanger for the decoration. 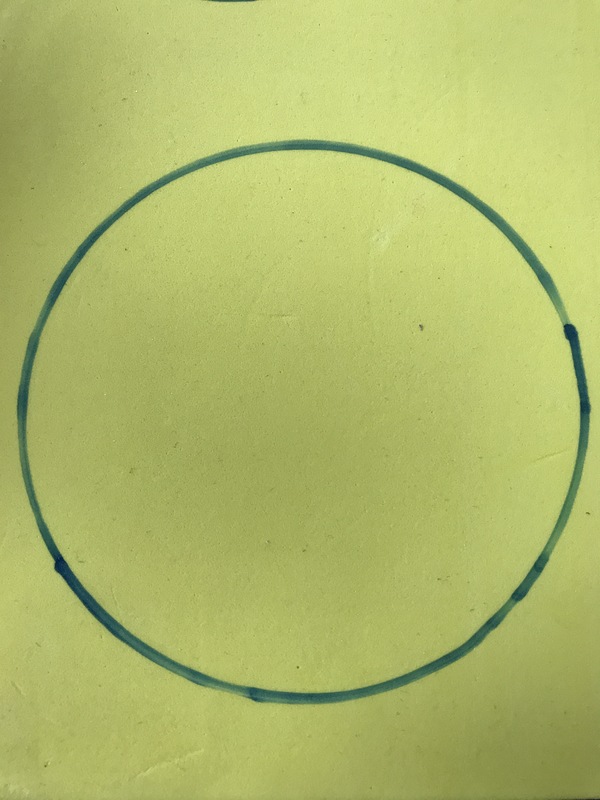 For the tip of my firework, I cut a circle out of a yellow craft foam sheet. I cut a slit to the center and with some finagling formed it into a cone shape. A spot of hot glue keeps it together. Next, I trimmed one of the wooden skewers to match the length of the paper towel rod and began adding strips of yarn. 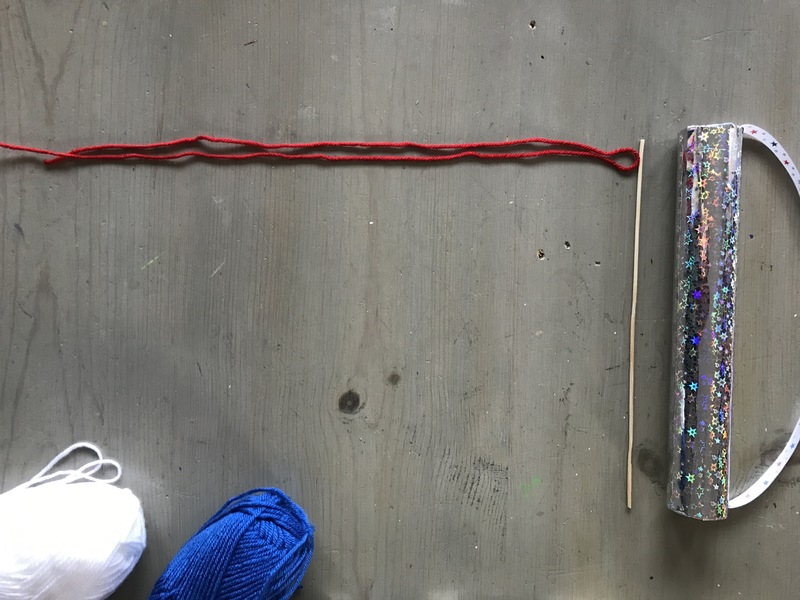 For the yarn strips, decide what length you would like them and then double it over. 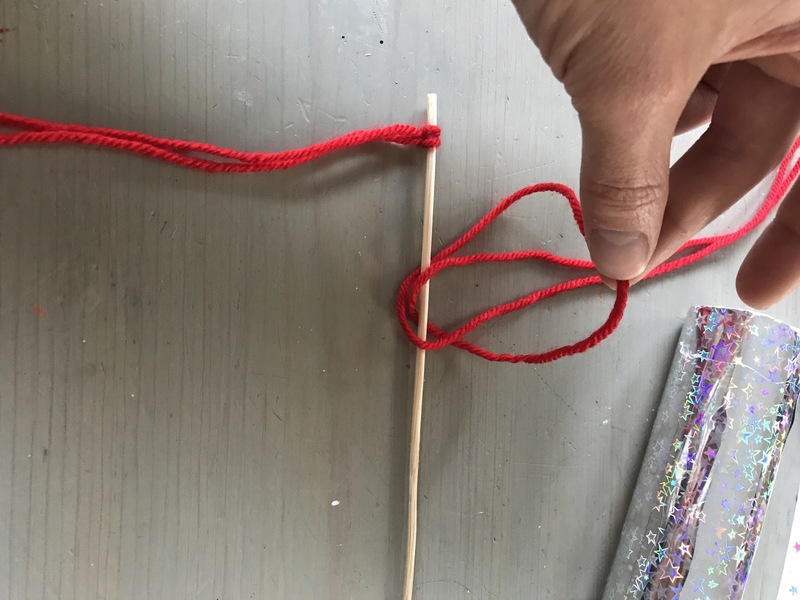 Place your folded piece of yarn under the skewer and pull the two loose ends through the hoop. Continue adding on strips until the skewer is covered. I decided to trim my yarn strips to form a triangular shape. I placed painters tape down and cut off the unwanted yarn. 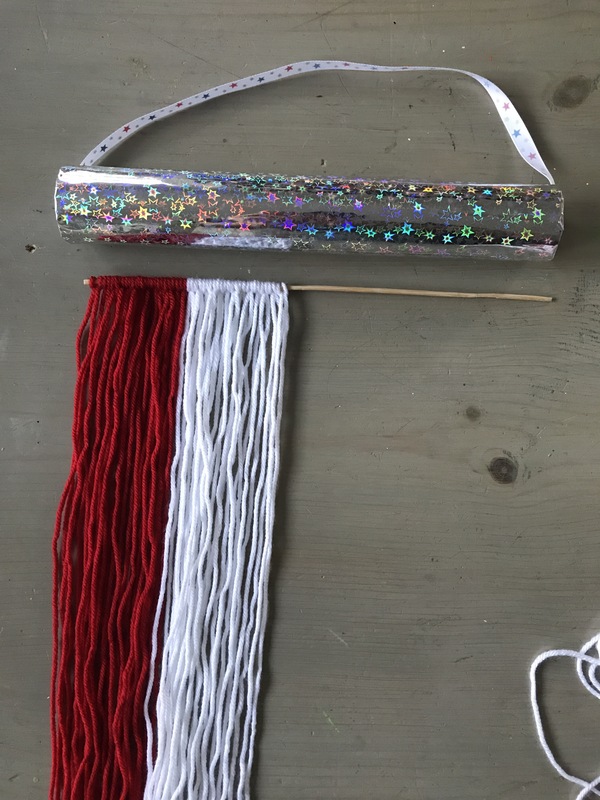 I attached the yarn skewer by running another piece of decorative ribbon through the center of the firework and tied it to each end of the skewer. 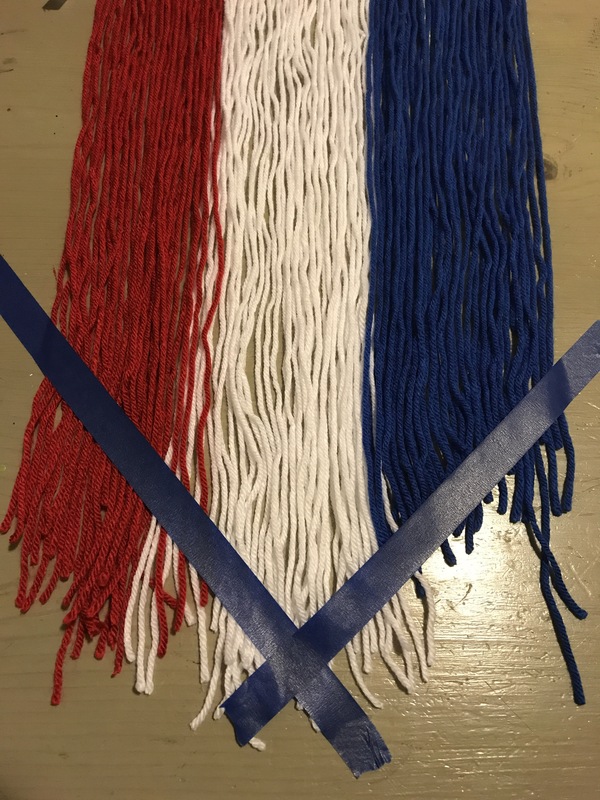 I added a few more strands of ribbon to each end for extra decoration. Finally, I hot glued the tip of my firework on and added a fuse at the end. 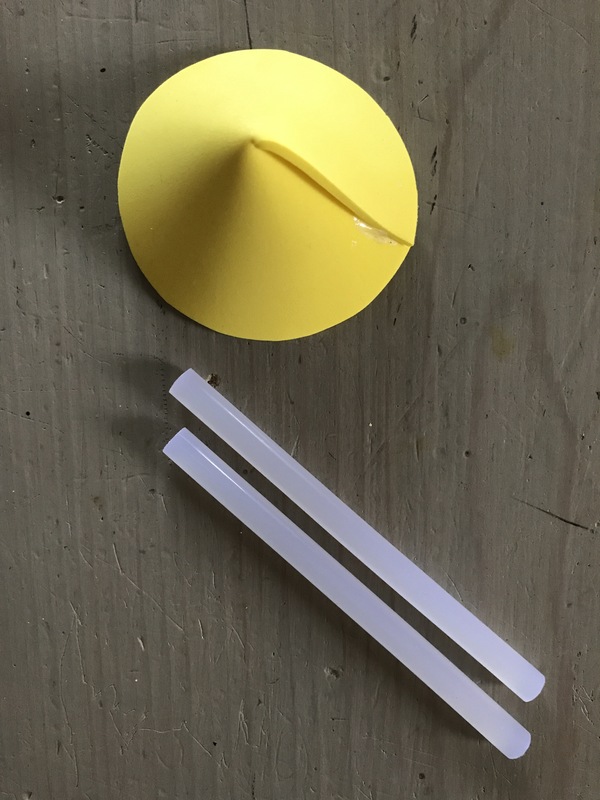 I created the fuse exactly like I created these NYE Cocktail Stirrers. Happy Fourth of July, everyone! I love it! Adorable. Thanks so much for the step by step instructions. How do you come up with all these great ideas?? 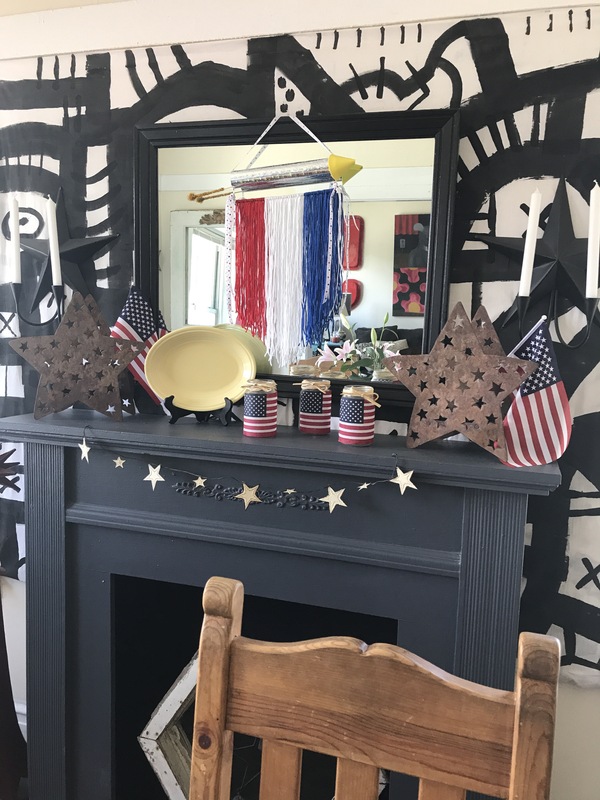 I could see doing this basic design( just take the part that makes it a firecracker) to use especially for kids who have a parent or family member in active duty with this ramping up going on…Anyone with ties to a group also who helps out Vets ..would make a nice room decoration for those living in a care situation be it at home or elsewhere( just be sure if in a facility they allow due to fire codes ) For either could place a family picture onto the yarn..center it..placed in a paper frame….or for the kids at home..a picture of their loved one..Overseas shipment.. once again..make sure it can be hung in a barack situation.. You’d be surprised at restrictions.. Theyr’e in place to assist in safety..( If you have someone overseas. you.already know/understand) VERY nice design!! Thanks!! Reminds me a lot of way back in the day( 1800’s) I’m always amazed at what creative people like YOU come up with!! Like that this is simple..and doesn’t cost a small fortune..PLUS left over supplies can be used on a next project!! Thanks! !